An Indiegogo campaign has been launched to preserve Historic Wintersburg in Huntington Beach, which has been designated one of America’s 11 Most Endangered Historic Places. In the late 1800s, the small agricultural community of Wintersburg Village was born. What is left of Historic Wintersburg tells the story of old California, Orange County agriculture, faith, and California’s Japanese Americans. The preservation effort began with a little curiosity: what were those old buildings at the corner of Warner Avenue and Nichols Lane? What came afterwards prompted local residents to come forward to save a historic property that had been hiding in plain sight for decades. The Historic Wintersburg blog (www.HistoricWintersburg.blogspot.com) was created in 2012. “Historic Wintersburg in Huntington Beach” by Mary Adams Urashima was published by History Press last March. The book contains stories of Japanese pioneers in Orange County, the Furuta family’s goldfish and flower farm, and a community effort that founded one of the oldest Japanese missions in California. The Wintersburg Mission is part of the unrecognized Japanese Mission Trail that began in the late 1880s in San Francisco and made its way down the coast to Wintersburg Village by 1904. The pioneers who settled Orange County survived drought, earthquakes, flood, World War I, Spanish flu, and the giddy rush of people coming to Southern California. Historic Wintersburg also is a rare Japanese-owned property that survived California’s Alien Land Laws of 1913 and 1920, and the traumatic upheaval of World War II. Everyone associated with the property — farmers, merchants, clergy and congregation — was forcibly evacuated from California and confined during World War II. Historic Wintersburg was named last June as one of America’s 11 Most Endangered Historic Places by the National Trust for Historic Preservation. It is the first time an Orange County property has made the list in its three-decade history and the only property on the current list in the western continental U.S. Historic Wintersburg was rezoned by its current property owner to commercial/industrial zoning, along with a plan for demolition. Without financial support, it faces complete demolition of all six historic structures by May 2015. All of the structures on the 4 ½-acre property are considered eligible for the National Register of Historic Places: the 1910 Wintersburg Japanese Presbyterian Mission and manse (parsonage); the 1934 Wintersburg Japanese Presbyterian Church; the last remaining pioneer barn in Huntington Beach, circa 1908-1912; the 1912 Furuta bungalow; and the 1947 post-World War II Furuta ranch house. In 2013, the U.S. Department of the Interior introduced with the U.S. Park Service a new Asian American Pacific Islander heritage theme study to identify and find ways to preserve Asian American historical sites. Less than 3 percent of all National Register listings represent places associated with diverse cultural groups, according to the National Trust. The immediate goal of the Indiegogo campaign is to raise $35,000 by Oct. 31 to fund an Urban Land Institute technical advisory and professional stabilization of the six buildings. The ultimate goal is to raise $50,000 by Nov. 30. The analysis of the property is conducted by a multidisciplinary team of builders, developers, preservationists, hisorians, real estate finance professionals, and planners to provide land-use planning proof-of-concept document explaining how the historic features on the property can be preserved, while incorporating adaptive reuse. This report is the tool that shows potential partners how historic preservation works in a financially viable and economically productive approach. Funds used for stabilization of the buildings will go toward removal of debris or ephemera that may degrade the buildings before preservation, tree trimming, branch and brush clearing near buildings, and any additional security measures that may help stabilize the structures, which, according to a recent inspection by representatives from the U.S. Park Service, retain “remarkable integrity” and can be beautifully restored. The long-term objective is to work with partners to acquire the property from the landowner, who is willing to sell. The Historic Wintersburg Preservation Task Force is working with the National Trust to reach out to potential partners in preservation. The property may be valued at approximately $5 million. Contributions that exceed the $50,000 goal will go to the dedicated Historic Wintersburg Preservation Fund, which has public oversight. This funding helps the task force work with other financial partners to buy the property and begin its restoration. The task force said that donors will help save part of California’s mission history; preserve a permanent, tangible memorial for American civil liberties education; and ensure that future generations have a place to honor all the remarkable pioneers who settled the American West. 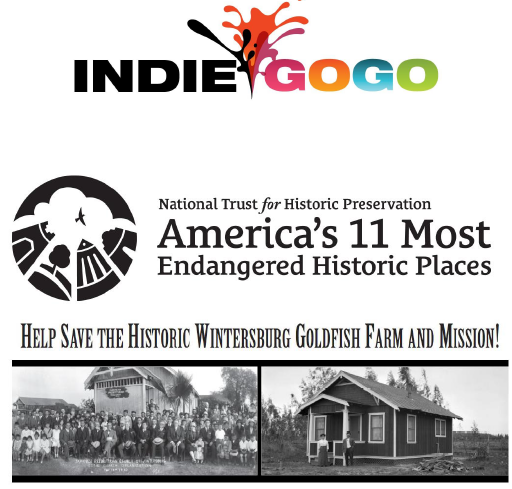 For more information, visit https://www.indiegogo.com/projects/save-historic-wintersburg.